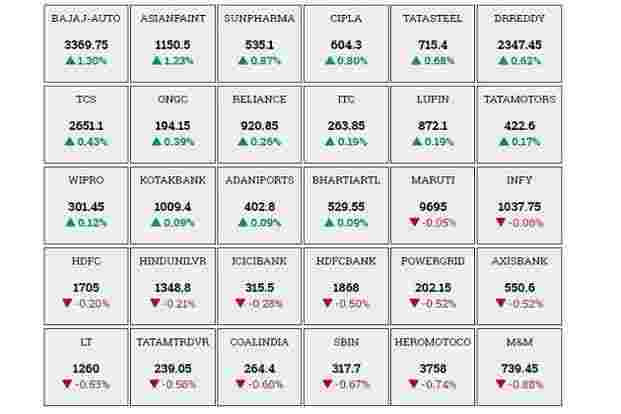 Mumbai: BSE Sensex and NSE Nifty closed at record highs on Tuesday helped by gains mainly in metal, telecom and pharma stocks. Sensex hit an all time high of 34,061.88 before settling 0.21%, or 70.31 points up at 34,010.61. 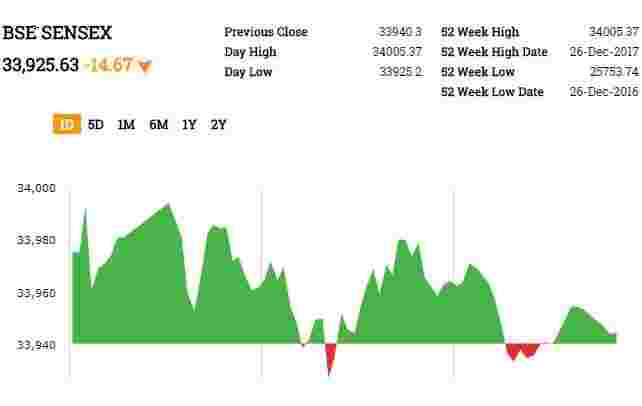 Nifty touched a record high of 10,545.45 before closing at 10,531.50, up 0.37%, or 38.50 points.All the sectoral indices on BSE ended higher. Reliance Communications Ltd shares rose 30.78% after the company announced its debt resolution plan. On the NSE, the Nifty PSU Bank fell 0.71%. Bharti Airtel, Sun Pharma, Yes Bank and Tata Steel were the top gainers, whereas NTPC, SBI, Coal India and M&M were among the major losers. BSE Sensex closed higher by 70.31 points, or 0.21%, to 34,010.61, while the Nifty 50 gained 38.50 points, or 0.37%, to close at 10,531.50. Reliance Communications Ltd surges 37.89% to Rs22.49 after the company announced debt recast plan. BSE Sensex traded lower by 23.05 points, or 0.07%, to 33,917.25, while the Nifty 50 edged down 6.35 points, or 0.06%, to 10,486.65. Reliance Communications Ltd surged 19.25% to Rs19.45 ahead of media briefing. According to a report in The Economic Times, a deal between Anil Ambani’s Reliance Communication and Mukesh Ambani- owned Reliance Industries is slated to be announced today. The Indian rupee was trading at 64.07 a dollar, down 0.03% from its Friday’s close of 64.05. On Monday, markets were closed due to Christmas. The 10-year bond yield was at 7.264%, compared to its previous close of 7.271%. Kirloskar Oil Engines Ltd said a report published in Mint about a possible acquisition the company by Cummins is a rumour and factually incorrect. Shares traded 7.76% higher at Rs410.55. IFCI Ltd said the Securities and Exchange Board India has imposed penalty upon the company in the matter related to Goldyne Technoserve Ltd. The shares traded 2.39% higher at Rs27.90. Larsen & Toubro said that the building and construction business of L&T Construction received an order worth Rs3,3355 crore. L&T shares traded 0.16% lower at Rs1,264.60. Vodafone India announced that it plans to launch VoLTE in January 2018. The company said, in first phase, VoLTE service will be available in Mumbai, Gujarat, Delhi, Karnataka and Kolkata. BSE Sensex traded lower by 22.58 points, or 0.07%, to 33,917.72, while the Nifty 50 edged down 4.75 points, or 0.05%, to 10,488.25. Banking stocks fell. Syndicate Bank fell 3.2%, Indian Overseas Bank 1.8%, Punjab National Bank 1.2%, Allahabad Bank 1.1%, Union Bank of India 1%, Andhra Bank 0.8%, Oriental Bank of Commerce 0.8%, Indian Bank 0.6%, Dena Bank 0.6%, Canara Bank 0.6%, State Bank of India 0.6%. Adani Transmissions Ltd fell 2.5% to Rs229.70 after Moody’s revises Adani Transmission’s rating outlook to negative from stable following announcement of its binding agreement to purchase Mumbai power-distribution business of Reliance Infrastructure for Rs12,100 crore in cash. Reliance Communications Ltd (RCom) rose 5% to Rs17.03 after The Economic Times reported that a deal between Anil Ambani’s RCom and Mukesh Ambani’s owned Reliance Industries Ltd to be announced today. RIL rose 0.3%. Prakash Industries Ltd rose 5% to Rs 179.35 after markets regulator Securities and Exchange Board of India removed the steelmaker from its list of dubious companies. 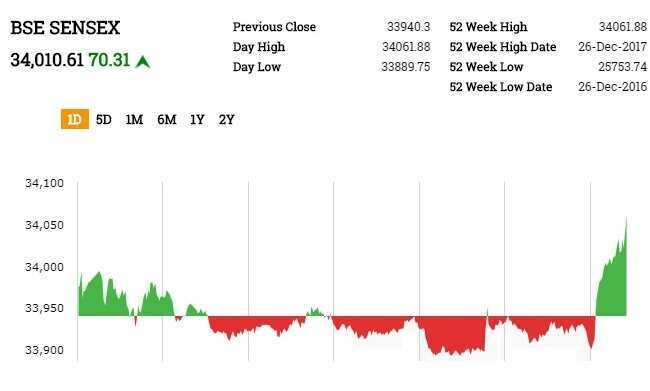 AIA Engineering Ltd fell 1% to Rs1,615.20 after the company said Brazil initiates an anti-dumping investigation on exports from India into Brazil. BSE Sensex traded lower by 14.67 points, or 0.04%, to 33,925.63, while the Nifty 50 edged down 2.45 points, or 0.02%, to 10,490.55. DB Realty Ltd rose 3% to Rs54 after huge block deal. Around 49.2 million shares of the company changed hands in 28 block deal, Bloomberg reported. However, details of the buyers and sellers were not known. Bitcoin extends its decline over the long holiday weekend, failing to reverse a selloff that began after an unprecedented rally fell short of breaching $20,000. Welspun Corp Ltd rose 6.3% to Rs145.10 after the company said in a BSE filing that it got a large oil and gas order for supply of 124 K MTs pipes. Kirloskar Oil Engines Ltd rose 17% to Rs430.15 after Mint reported that the Cummins Group is in talks to acquire a controlling stake in Kirloskar Oil Engines Ltd in a deal valued at over $500 million through one of its Indian subsidiaries. Gail India Ltd rose 2% to Rs512 after PTI reported Indian Oil Corp. Ltd and Bharat Petroleum Corp. Ltd are both keen to acquire gas utility GAIL India Ltd to become fully integrated energy companies. Binani Industries Ltd rose 5% to Rs146.10. According to a Business Standard report, India’s top cement majors, including UltraTech Cement of the Aditya Birla Group and Shree Cement, and the stressed asset investment fund of Piramal Enterprises and Bain Capital Credit have made aggressive bids for Binani Cement. The Indian rupee was trading little changed against US dollar on Tuesday in a thinly traded market as many dealers were on leave for the year end. The rupee opened at 64.03 a dollar and was trading at 64.02 a dollar, up 0.03% from its Friday’s close of 64.06. The 10-year bond yield was at 7.27%, compared to its previous close of 7.271%. On Monday, markets were closed due to Christmas. BSE Sensex opened higher by 36.05 points, or 0.11%, to 33,976.35, while the Nifty 50 rose 14.65 points, or 0.14%, to 10,507.65.